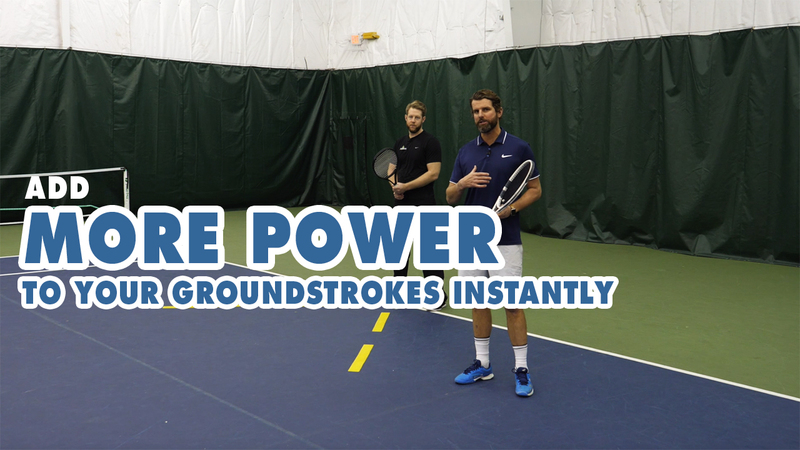 Today we show you a simple adjustment that will instantly add more power to your groundstrokes. 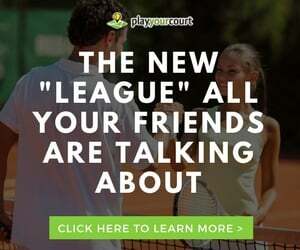 This video is for players with a PlayYourCourt rating of 70 and up. – Hey guys, Scott and Nate here from PlayYourCourt, and today we’re going to show you a simple secret to generate way more power on your groundstrokes. – All right guys, so today we’re talking about how to generate some effortless power on your ground strokes. This video is for players a little bit more advanced, PlayYourCourt rating of 70 and up, if you’re not in our community or familiar with our ratings system, the 70 PlayYourCourt rated player is the equivalent of a USTA 4.0, so Nate talk to me here, effortless power on our groundstrokes, what’s going on here, we’ve got some dots on the ground, what are you talking to us about today? – Those dots are actually lines, Scott, but that’s okay. – That’s all right we’re good. – Hey, been a long day, I get it. Guys, probably gonna surprise you here, we’re not actually talking about the mechanics of the stroke itself, we’re actually talking about how you’re moving to the ball and what you’re doing with your momentum. 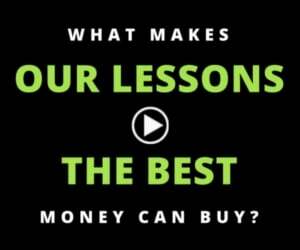 – Footwork will make your dream work? – Or is that teamwork? – make the dream work. I think that’s right. So what we’re gonna really talk about is getting up to the ball and not hitting the brakes. How do we slow down, but still use the momentum to drive through the ball, with the hips and the shoulders, and this is what you’re gonna be seeing the pros do. Really when they’re getting these short balls, this pivot step as we call it, which allows you to move forward to the net if you’d like, or to recover back with pretty much seamless ease. All right guys, so we’re back here and as you can see we’ve got lines down and what they’re indicating is that we’re getting a short ball and that’s the direction that Scott is gonna be moving in. The first thing we’re gonna show you is the incorrect way to receive this short ball. What Scott’s gonna do is he’s gonna track and where he’ll stop is where the ball will be that way you can imagine the contact. But Scott is gonna move up to the ball, and completely hit the brakes. And what you can see here is this leg is trying to stabilize, the hip is immobile because it’s trying to hold the position. And he’s gonna be pretty off balance here, if I give him a gentle nudge he’s gonna fall all the way over. And what this does is if you’re consciously trying to slow down and hit the brakes with the foot work, you’re also gonna get some tension in your hand, which is going to slow the stroke down itself, all right? So let’s show you mistake number two. This time Scott is gonna come up to a ball that’s weak, it’s short, and he’s gonna set up with an open stance. So the problem with this is now he’s just all crossed up, right? The momentum, unless he does a full 180 to get around the ball, right? It’s gonna be really really difficult to allow the hip to come all the way around creating effortless power. So now, let’s fix it. Let’s show the correct way on how to hit this forehand with the pivot step. Go ahead Scott. He’s stepping in with his front foot, and then he’s allowing the hip to work all the way around, and notice the easy, easy, recovery afterwards. Because as the right leg, one more time, one more time. As the right leg comes all the way around, he can now push back to center here. This is gonna give him easy power, it’s gonna let the rocket move effortlessly, and he has his choice, he can go down the line, he can go cross court, and he can recover, or he can go to the net. All right guys, as you can see we’re over here on the ad-court and what we’re gonna work on is the short backhand. I know many of you, this is going to help immensely. I struggled so much as a junior, coming up to balls and hitting the brakes and feeling really cramped up through the backhand while trying to be aggressive. And I ended up having some problems with the lower back, the hip, because of doing this incorrectly. And what Scott’s going to demo here is exactly what we’re talking about. Hitting the brakes, and really running into a wall as he’s trying to get through the stroke and create big power. – So the wrong way. – Oh I feel off balance. – Yeah, immediately an imbalance. So he’s pulling off the ball, probably gonna hook the ball wide, right? And at this point there’s really no way to get the racket all the way through effortlessly, because the hip is the road block. That’s what I want you guys to take away from this, is by not allowing the hip to come through, with this much momentum forward, the road block is gonna create this imbalance, just destructing the entire stroke. – Yeah, I feel real tangled up, when I hold it. I feel like I’m going to fall to the left, and my whole body just feels tangled up. – Feels like a jerk, yeah. Feels like I jerked the backhand almost. – No good, so let’s talk to them a little bit about the right way, okay? And it’s gonna be the same exact thing we saw in the forehand, he’s just gonna bring his left foot around on a pivot. And notice the quick recovery, right? And now here’s the nice thing, so Scott show us if you wanted to go to the net off this one. Right either which way, whether he’s going forward to the net or he’s recovering, he’s always allowing that left hip to come around. Now one little note here, this is really important, what you don’t wanna do is hinge like a door in this movement, and what I mean is coming up and immediately pulling the leg around. That’s not what we’re talking about. As you can notice too, one more time Scott, the hip holds back just a little bit, but he releases it through the stroke, all right? I think if you guys really pay attention to what your feet are doing, coming up to the ball and being aggressive, getting to the ball a little bit earlier, proceeding to the net, or quick recovery, your groundstrokes are going to be monsters. So put a little attention to what you’re doing with your hips, and your shoulders, take your foot off the brake, all right? And by doing that you’re gonna have just massive, explosive power off of your forehand and backhand. – Yeah Nate, so that’s great instruction and guys I hope this really helps you deliver some more power to your groundstrokes. A lot of the instruction we deliver is more high level, a lot of it’s for more rec players than lower level, what we need to know is just more information about your game so we can send you some custom video coaching for the things you need to work on. So do us a favor, click the button, click the link below, answer some questions for us, and Nate and I will send you some custom video coaching based on the things that you at your exact skill level need to be working on. Just click the button or the link below and Nate and I we’ll do the rest.